CGIAR is a global agricultural research partnership for a food secure future that was founded in the 1970s in response to the Green Revolution. There are presently 15 CGIAR agricultural research centres employing more than 8,500 researchers and support staff worldwide, with an annual budget of US$800 million. The CGIAR System Organization of centres is its driving force, coordinating 15 CGIAR Research Programmes of global scope, in close collaboration with hundreds of partner organizations (national and regional research institutions, civil society organizations, universities). The new environmentally friendly building (860 m²), has been built completely by the Languedoc-Roussillon region, and is valued at 2.7 million euro. It was designed by the French architectural firm Francis Fontès. « C’est toute la région Languedoc-Roussillon qui est à l’honneur …mais aussi la France et le monde international de la recherche agricole, en témoignent les nombreuses personnalités internationales présentes aujourd’hui ». Mrs. Anne-Marie Descôtes, Director General, Ministry of Foreign Affairs (MAEDI) satisfied with the hosting of CGIAR System Organization Headquarters in France and the support from two new countries, Colombia (represented by H.E. Federico Renjifo Velez, Ambassador of Colombia in Paris) and Senegal (represented by the Minister of Agriculture and Rural Equipment, Mr. Papa Abdoulaye Seck), who expressed their wish to join in and sign the agreement which establishes the official granting of International Organization status to CGIAR System Organization, France being the authorized depository. 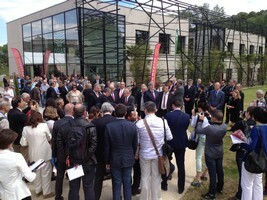 The inauguration of the new CGIAR System Organization headquarters took place in parallel with the International Encounters “Family Farming & Research” held in Montpellier from 1st to 3rd June 2014. 19th June 2013: Cooperation reinforcing between the French research organizations and the CGIAR: a French partners meeting (Cirad, IRD, Inra, Agreenium, Irstea) with the CGIAR CRPs leaders (CGIAR Research Programs) was organized on the Cirad initiative and under the CRAI aegis, at Agropolis International. The objective was to allow research bodies and the Consortium to be better self-aware and to discuss concrete forms of cooperation, in the continuity of the agreements signed on March 4th, 2013. Program: presentation of French collaboration within the framework of 10 CRPS and exchanges with the representatives of CRPs, display of transverse themes (data sharing, impact evaluation, post-doc program, etc. ), presentation of Agreenium and Agropolis Fondation. This signature ceremony will take place just after the Foundation Stone Ceremony of the CGIAR building organized by the Languedoc-Roussillon Regional Council at Agropolis International . End 2013, the CGIAR System Organization will have his own building, next to Agropolis International. This building is entirely funded by the Languedoc-Roussillon region. Dr. Rijsberman’s extensive experience in international agricultural research, especially in the field of water management, coupled with his valuable leadership and management skills, make him ideal for this vital role. In his current position as the director of the Water, Sanitation, & Hygiene strategy of the Bill & Melinda Gates Foundation, he leads a team tasked with alleviating the burden of water-borne diseases and improving access to sanitation, especially in Africa and Asia. The CGIAR System Organization, representing the world’s largest global agriculture research partnership aimed at reducing rural poverty and hunger was officially granted International Organization status on March 2nd, 2012. 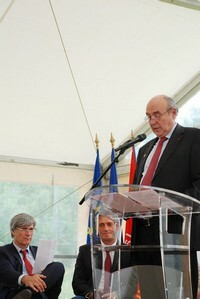 In the context of the G20 conference held in Montpellier on September 12-13, 2011, the French Minister of Cooperation has signed, together with the Hungarian Ambassador in Paris, the Agreement establishing the Consortium of International Agricultural Research Centers as an International Organization. He has welcomed the hosting by France of the CGIAR System Organization headquarters from March 2011 owing to the synergies between the Languedoc-Roussillon Regional Council and the State. The Agreement, of which France is depositary, is now open for signature in Paris before its ratification. The French Commission for international agricultural research (CRAI), chaired by Bernard Hubert, the Agropolis International President, has signed a declaration of intent with the Consultative Group on International Agricultural Research (CGIAR) which aims to ensure more effective coordination of the efforts made by the different organizations concerned in terms of research and partnerships. On the occasion of the G20 Conference on Agriculture Research for Development held in Montpellier on September 12 - 13, 2011, the French Commission for international agricultural research (CRAI) and the Consultative Group on International Agricultural Research (CGIAR) have signed a common declaration of intent at Agropolis International.. 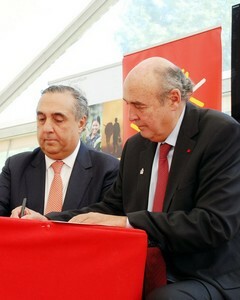 Through this signature, research institutions involved in the CRAI (CIRAD, INRA, IRD, IRSTEA, Agreenium) and the CGIAR System Organization commit themselves to better coordinate their efforts in order to meet global challenges such as poverty reduction, food security or natural resources management. The coordination will cover the research projects, partnerships, and strategic frameworks and visions of each party. It will also contribute to effective global coordination of agricultural research for developement. 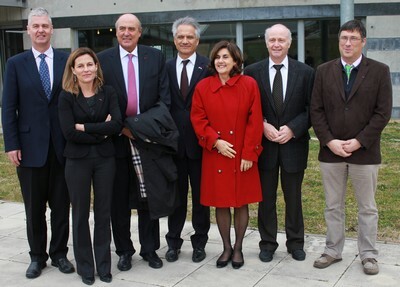 First consequences of the CGIAR System Organization set up in Montpellier: The Fund Council, the strategic and financial component of the new CGIAR, hold its last meeting on April 5-6, 2011 at Agropolis International. It has been immediately followed on April 7 by the 2nd Funders Forum meeting, which gathered all the entities funding CGIAR programs and activities. On April 6th, Mrs Inger Andersen, Chair of CGIAR Fund, has invited all the participants, along with representatives of Agropolis International and regional research institutes to an informal get-together. Feb. 29- March 1, 2012: Board meeting, preceded by the meeting of the Directors and Presidents of the 15 international agricultural research centers. May 5-6, 2011: Board meeting, preceded by the meeting of the Directors and Presidents of the 15 international agricultural research centers. The aim of the Consultative Group on International Agricultural Research (CGIAR) is to mobilize the best international scientists in the agriculture field to ensure food security and reduce poverty through the production of global public goods to benefit developing countries. CGIAR, which was founded in 1971, is a strategic alliance of 64 public and private donors (governments, private foundations, international organizations) that support a network of 15 international agricultural research centres. It is sponsored by the Food and Agriculture Organization of the United Nations (FAO), the International Fund for Agricultural Development (IFAD) and the World Bank (WB). Overall, the 15 research centres employ more than 8,500 researchers and support staff in over 100 countries worldwide. In 2009, its annual budget was US$572 million. CGIAR initiated a major reform (officially supported by the international community (see the G8 L’Aquila Declaration, July 2009) in order to boost the impact of its activities on agricultural production in developing countries, with one of the pillars being the founding of the strategic operational pilot Consortium of 15 international research centres.